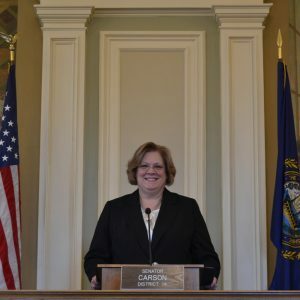 Today, Senator Sharon Carson (R-Londonderry) issued the following statement on the passage of SB 63, which would extend the timeline for retaining abuse and neglect reports. “This legislation serves to strengthen the screening process for abuse or neglect reports and would allow for those reports, to be kept on file for much longer than the one year limit previously in place in certain cases. It also requires founded abuse or neglect reporter be kept indefinitely. “Keeping these reports for seven years is critical to DCYF’s case manager’s ability to determine if a pattern of behaviors over a longer period of time. “Passing this legislation is an important step in our ongoing efforts to ensure that children in the DCYF system are protected from abuse and neglect.